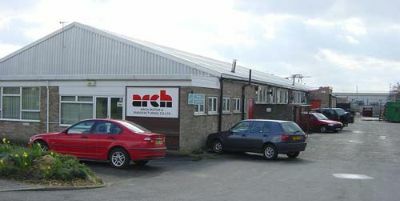 A couple of months ago we went up to Arch Motorsports in Huntingdon, Cambridgeshire. We were taking Marks car up to have a broken diff mount repaired. 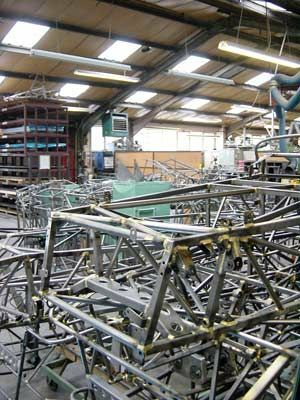 Once we had dropped the car off we were treated to a tour of the factory. With permission I took some pictures, some of which are here. I could happily have spent a whole day at Arch. 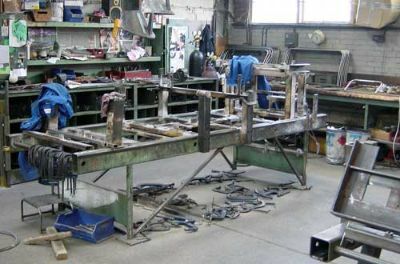 It is just the sort of fascinating traditional workshop you would expect. 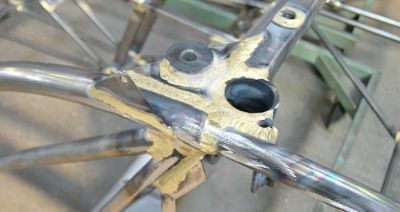 In every corner were recognizable components from our cars, and a few that were not recognizable as well! 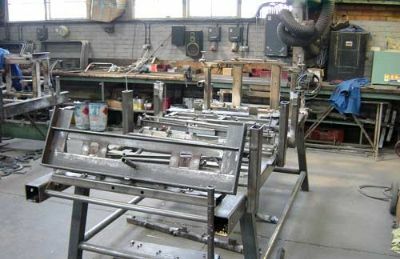 There were jigs, frames moulds and bucks. 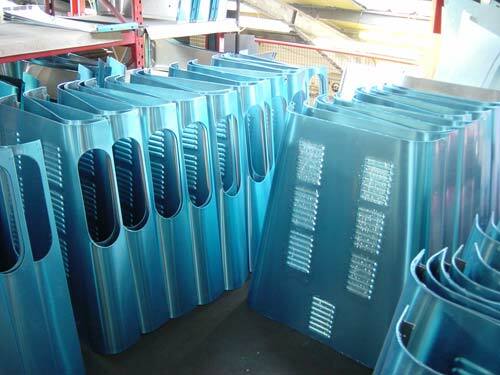 Upstairs were racks of aluminum panels, side skins, windscreen surrounds and scuttles, all covered in their protective blue film before being taken back downstairs and assembled onto the freshly painted chassis. Broken diff mount on Mark's car - the reason for the visit. 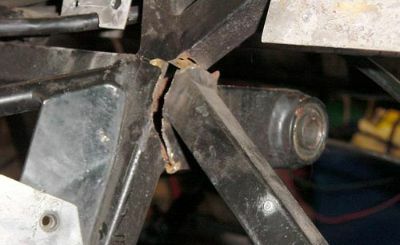 This type of diff mount failure can be found on earlier chassis. 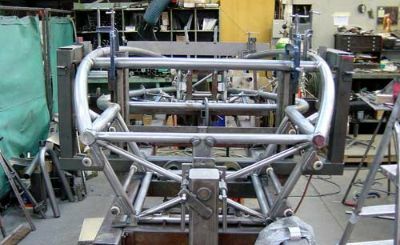 Later chassis, and indeed the Arch repair, use a slightly thicker gauge steel tube to prevent such damage. 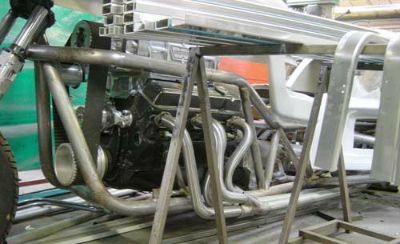 I guess the advent of much more powerful engines and the subsequent increase in stress on the chassis has meant that certain parts have been upgraded and strengthened. The failure on Marks car was interesting because it seems that the diff mount fracture shown here had actually happened a while ago - dirt and rust on the crack gave this away. The final failure came to light at a Brands track day where a cracking noise followed by associated grinding banging noises signaled the early end to the day. On inspection it was found that the top diff mount bolts had actually sheared on the day, allowing the diff to rattle loose and drop. 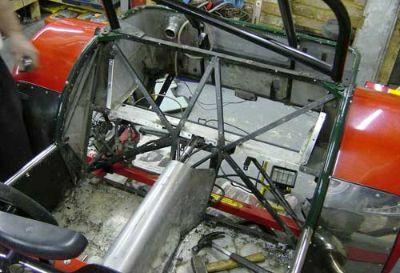 The extra strain placed on the bolts by the broken chassis had finally proved too much and the last one snapped. 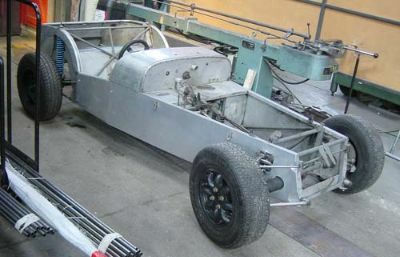 Before taking the car to Arch for repair, we stripped all the relevant bodywork. 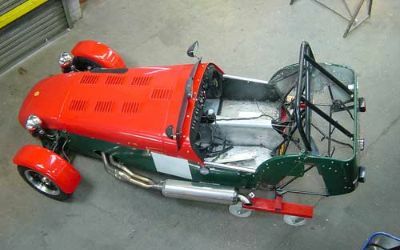 This included rear bulkhead, fuel tank and boot floor and all suspension components. We took the car up by trailer, with the rear still attached to the dolly, so as to make maneuvering easier at each end of the trip. You can see the dolly in position here. 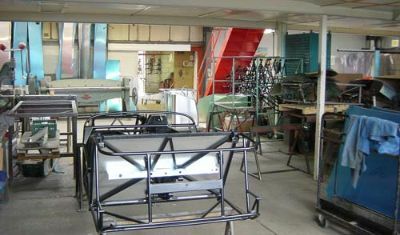 Arch workshop - the site is divided into various areas for jigging, assembling, painting and repairing all manor of cars - many of them active race cars! 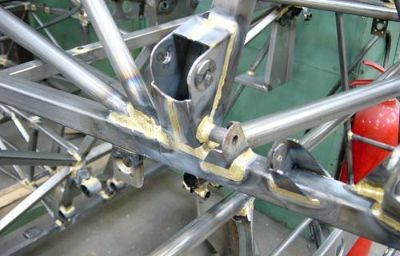 Caterham chassis jigs - I guess all our cars have been here! 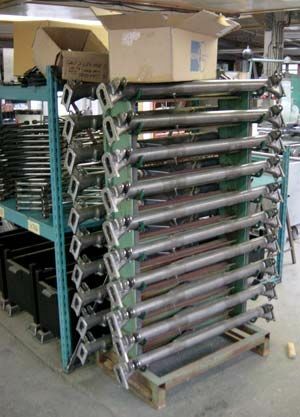 Note all the G-clamps. ...if you look even closer you will also see that they have Caterham's new IRS components - I guess these are bound for the French race series that have started to use these new developments. 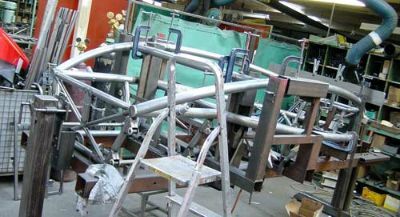 It is only when you see an unpainted chassis you realize how much work goes into each one, and how many individual components go into each one. 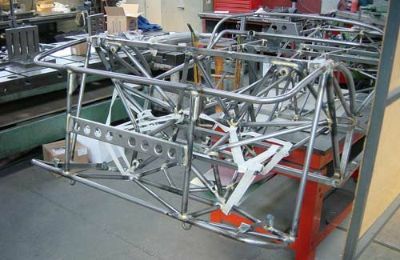 Another view of a chassis. 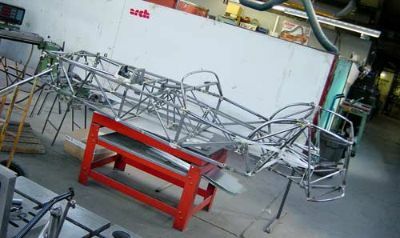 Arch also assemble other well known car chassis - in this case you can recognize an Aerial Atom chassis taking shape. 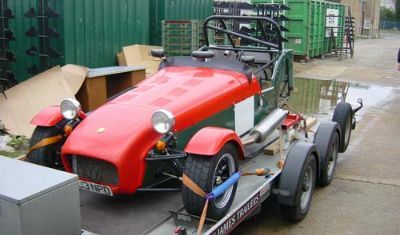 ...complete with V6 lump and rather big supercharger! 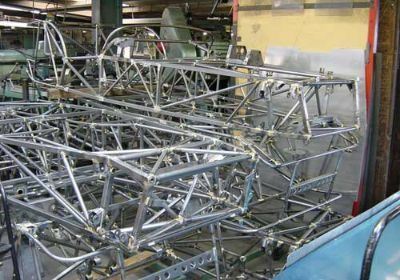 Another view of chassis heaven! 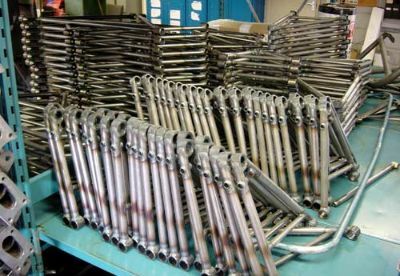 A couple of wishbones and behind, a stack of A-frames. 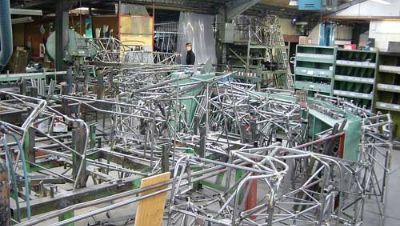 Racks of De-Dion tubes awaiting completion. 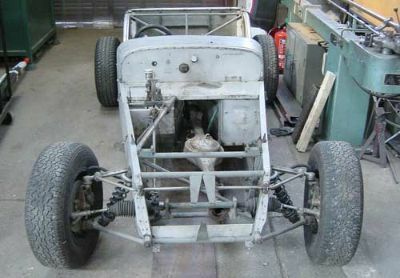 I am guessing this is quite an old chassis, awaiting some sort of work. STOP PRESS!!! 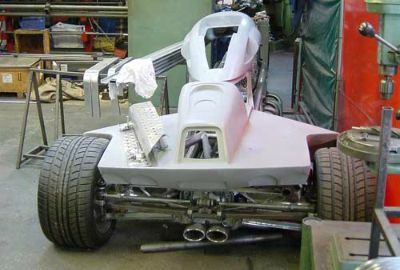 - or is this actually some sort of secret 4-wheel drive prototype??! !